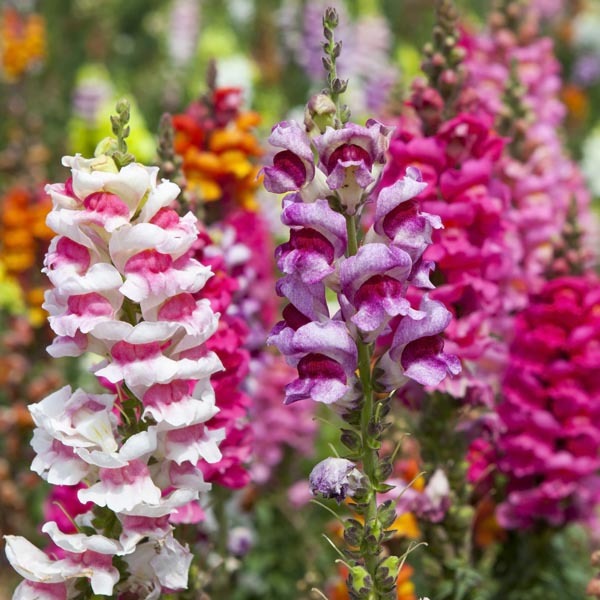 A “medium-sized” snapdragon. Creates a strong vertical line of color, similar to taller varieties, but without the need for cages or staking. This flower gets its common name from the individual florets that resemble the shape of a dragon head. Pinch the flower on the sides and the bloom can be snapped open and closed similar to a mouth. A fun flower for a child’s garden! The perfect choice for beds and borders. Looks great in rock gardens. Perfect for all kinds of containers. Wonderful for combination plantings. Prefers fertile, sharply drained soil. Allow soil to dry between thorough waterings. Remove faded flowers for best display. Available Colors: Flowers in shades of pink, orange, white, yellow, red, and purple.